Substantial research has been dedicated to post-colonial productions in African Studies, Postcolonial Studies and Film Studies. Francophone and Anglophone film productions have been extensively assessed in academic writings; however there is a lack of critical research on the subject of Lusophone cinemas and co-productions. 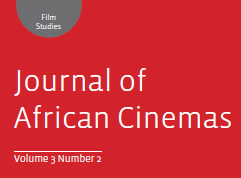 This special issue of Journal of African Cinemas intends to address this shortfall in academic work by presenting a critical and informative body of research on the subject. The seven essays in this issue present a pluralistic perspective on filmmaking in territories that belonged to the historic empire of Portugal in Africa. On a whole, the volume highlights the cultural and socioeconomic contexts of Luso-African Cinema in Africa, especially from a period in African history when the issue of the intertwinement of “nation and cinema” proved crucial. The essays interrogate a diversity of themes and stylistics in the production of cinema in the five nation-states of Angola, Mozambique, Guinea-Bissau, Cape Verde and Sao Tomé e Príncipe. These five former Portuguese colonies gained their independence from Portugal between 1973 and 1975 as a result of the collapse of the right-wing authoritarian regime of Salazar–Caetano. Subsequently, liberation organizations involved in the armed fight for independence, including: FRELIMO (Liberation Front of Mozambique), MPLA (Movement for the Liberation of Angola), and PAIGC (African Party for the Independence in Guinea and Cape Verde) during the 1970s, invited international filmmakers to accompany their civil warfare. Through cinema film-makers depicted the historical, political and social impacts of colonialism and civil war on the different countries’ populations in these countries. However as Maria Loftus argues, the post-independence reality facing film-makers and the industry itself in Lusophone Sub-Saharan Africa was bleak, as no cinematic infrastructure had been put in place by the colonial rulers. To this end Loftus and Ros Gray point out, the presence of politically engaged foreign film-makers had instilled a degree of respect for cinema as a powerful media tool, and in the case of Mozambique, had familiarized its people with the notion of a non-commercially driven cinema. Portugal established a vast amount of transnational cinematographic partnerships with these Luso-African countries which has resulted in twenty co-productions so far. This, Caroline Overhoff suggests has had profound meaning for the discussion of colonialism and post-colonialism. National cinema, through co-production with former the ruler, is a means for creating new national identities, histories and socio-political paths. There is a cinematographic body of work which contradicts the heroism of the exploitation of the Portuguese army in Sub-Saharan Africa, striving to give an alternative vision of the wars of independence. One of these works is a monthly series of documentaries produced in Mozambique from 1978 to 1986 by The National Institute of Cinema (INC), entitled Kuxa Kanema (birth of the image). The Loftus article explores this series’ symbolism as a political will to transform cinema into a weapon of ideological struggle for a fledgling socialist democracy, and as a means to decolonise the distribution and production circuits in the country. The external problems of the 1980s, namely, the geopolitical and socioeconomic circumstances generally linked to the Cold War and the consolidation of global capitalism, meant a paradigm shift in African Lusophone countries. This involved a move away from mono-party regimes that dominated the years immediately following independence, towards market-oriented multiparty states. In Mozambique and Angola, this critical shift took place under the shadow of devastating civil wars. However, following the end of the civil wars (in 1992 and 2002, respectively), Mozambique and Angola have become relatively stable democratic states, experiencing significant sociopolitical changes and economic growth. Two articles in this issue examine the impact of conflict post-civil war in Mozambique and Angola. In the first of these Fernando Arenas offers a critical overview of Mozambican cinema since the end of the civil war. The article highlights the work of Brazilian-born Licínio Azevedo who has chronicled cultural life in the southern African nation as it has transitioned from a single-party state economy and polity towards a multi-party and market-oriented state. This article offers a critical analysis of several of Azevedo’s films, his role as socially engaged film-maker, and the current state of cinema in Mozambique. It explores all the hopes, contradictions, promises, and failures of that country and its people and culture – as depicted in the works of Azevedo. The analysis of the Angolans’ experiences of the civil wars and the damage these conflicts have had on citizens around the country is examined in Antonio Da Silva’s critique of two post-civil war feature films from Angola. The critique of Maria João Ganga’s Na cidade vazia (Hollow City) (2004) and Zezé Gamboa’s O herói (The Hero) (2004) illustrates how these years of conflict disrupted the lives of thousands of Angolan civilians and had gradually snuffed out that country’s short but distinguished film-making tradition. This is made evident in the low number of films produced between the 1960s and early 2000s. However, in spite of this recent historical context, Angola is now a major economic and geopolitical player in sub-Saharan Africa. As O herói’s message suggests, Angola has been able to reconstruct itself. Continuing peace has also expanded opportunities for cultural expression, as Mark Sabine’s article points out. Though, as anywhere in Africa (even those countries colonised by British, French or Belgian), Angolan film-makers must secure funding and production resources from outside their own countries. Distribution in the international film festival circuit, ironically, has to be additionally secured before they can hope to reach a broad local audience. In the first years of independence, the socialist governments in Angola, Cape Verde, Guinea Bissau, and Mozambique established film institutes to start national film production, whose mission was to be political, cultural and artistic in nature. Across the continent, a militant notion of the role of culture – filmmaking and other cultural actions – in political change was being developed by the leaders of the Lusophone liberation struggles. These struggles were mostly against capitalist imperialism, both during the war against Portuguese colonialism and after independence. The shared experience of Portuguese colonialism meant that FRELIMO, PAIGC in Guinea-Bissau and the MPLA in Angola remained closely connected, and their concepts of culture’s role in revolution developed in tandem. Despite this connection, we note that unlike their British and Belgian homologues, the Portuguese did not train any Africans for the technical aspects of film production. This left the political authorities of these fledgling Lusophone African nations with no other option than cooperation with other nations, often on the grounds of ideological affinity. As such, the first technical and logistical support in Mozambique came from cooperation with Cuba and the former Soviet Union. This also explains why in Mozambique documentaries were shot by foreign filmmakers (European and Latin-American) with the participative sympathy of militants belonging to various separatist movements in a bid to establish a post-colonial cinema in the country. Ros Gray’s article makes the point that the involvement of influential foreign figures within this Lusophone African nation demonstrates how aesthetic ideas formed through transnational connections of militancy, have the potential to fuse with indigenous cultural expressions of anti-colonial resistance. Some of these influential talents include the likes of filmmakers Licínio Azevedo, João Ribeiro, Sol de Carvalho, Jean Rouch and Jean-Luc Godard, among others. Portugal also established a vast amount of transnational cinematographic partnerships, including those with its former colonies and treaties with the African countries with Portuguese as the Official Language (PALOP) in the 1980s and 1990s. From this Portuguese perspective, as Carolin Ferreira Overhoff’s article stresses, the interest in co-productions with former colonies is twofold. On the one hand, it offers profit and job opportunities for production companies, laboratories, technicians and directors while on the other, the possibility to reflect on the colonial past and its legacy. From the PALOP’s point of view, the co-productions presented an opportunity to return to film production after years of absence or, in the case of Cape Verde, to finally become a film producing nation. 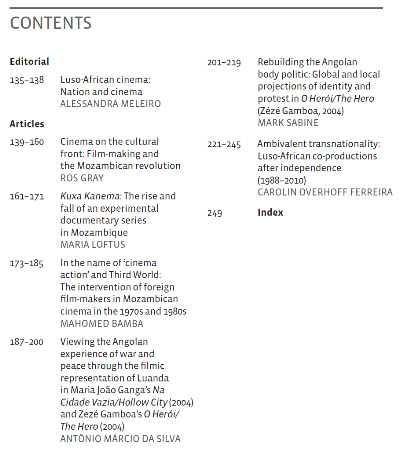 Mahamed Bamba’s article suggests that the participation of certain Brazilian filmmakers in Mozambican cinema reveals a wealth of learning for the study of the multilateral relations between Brazil and Mozambique as well as other Portuguese-speaking African nations. In the field of cultural and audiovisual cooperation that marks the re-approximation between Brazil and Africa, we can discern a mutual respect for the sensibilities and concerns of each people. 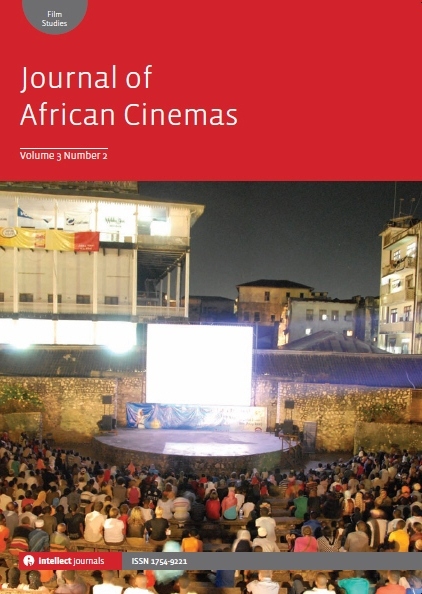 This issue on Luso-African Cinema and co-productions explores the moving image during the various revolutions and post-colonial struggles as an agent of social, political, economic and cultural change. Film-making in these Luso-African countries, as discussed in the articles presented in this discussion, assess how the struggle for socio-cultural change involved the decolonizing of film-making itself – in all its modes of production, distribution and screening.